"93X FireEscape Radio...It's HIS station." 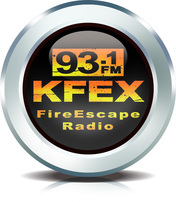 That’s the sound of KFEX 93.1fm, a low power Christian rock station that went on-air in 2004. We are a non-profit, listener supported outreach ministry of the FireEscape Coffeehouse and we are heard in all 50 states and around the globe through our 24/7streaming on the internet. Click on our “Listen Live” button or download our KFEX app for your phone from the App Store. Our mission is to present the Gospel of Jesus Christ through music and positive programming which includes encouraging moments and radio shows by our DJ’s.